We appreciate you checking out our site to learn more about Cloudbric and your interest in advocating web security. Definitely, updating your CMS is one of the basics in securing your website and we’re glad you brought this up! Cloudbric’s WAF sits in front of our web server, so fortunately, our website isn’t left vulnerable. However, many website owners (w/o security) do not update their WordPress for other reasons – plugins may no longer work as intended and website owners may rather not undergo an approval process by their developers to apply those updates. But, we value your feedback and agree with encouraging other website owners by adhering to the same web security best practices. You’ll see that with our website renewal we’ve updated our WP version. With regards to the importance of active protection, we stand by our belief that websites are generally left vulnerable without deploying any WAF solution. Website owners choose to deploy active protection like WAFs because addressing all vulnerabilities in a website through meticulous secure coding and design is very difficult for most. Rapidly evolving unknown and modified threats, for example, cannot be anticipated and dealt with in real-time by even the most expert of developers. 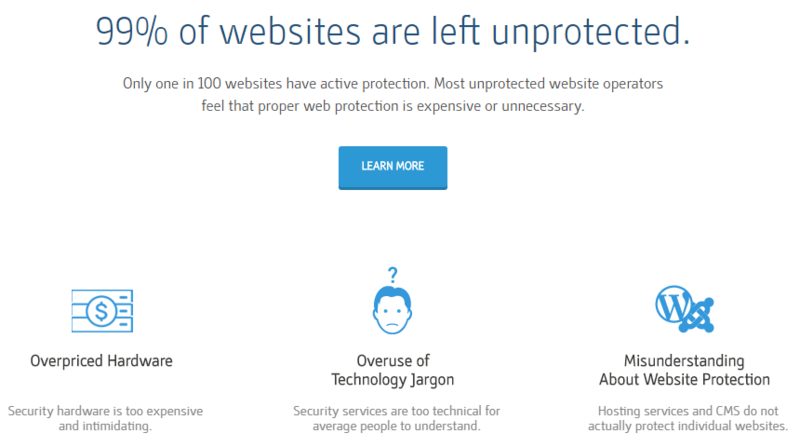 Hence, we believe it is a fair assumption that websites without active protection face significant vulnerability. In the comparison with SiteLock, you’ve mentioned that Cloudbric had missed 101 samples. However, we’d like to clarify that this is due to the nature of the testing conducted. As written in the report, the 1000 samples within the attack set included a hundred valid HTTP requests, to test for how accurately a WAF distinguishes between legitimate and malicious traffic (ability to avoid false positives). This is largely why 101 samples passed through detection. Our renewed website contains updated content, so we’re glad you pointed out that the reference to SiteLock’s use of ModSecurity is not up-to-date – it’s now been removed! Thank you for engaging with our content – we’re glad to see that there are others who care and are passionate about website security and website cleanup! Your comments only reinforce the impression given that your company doesn’t really understand security issues surrounding websites, even with your own website. However, many website owners (w/o security) do not update their WordPress for other reasons – plugins may no longer work as intended and website owners may rather not undergo an approval process by their developers to apply those updates. Actually most most websites are keeping up to date with minor WordPress updates (which are the security updates) because they normally happen automatically. As what happen with Trend Micro not that long ago shows updating WordPress actually provides better protection than than using some security product over a website, as was mentioned in the post. Issues with plugins would generally be caused major updates, while your website wasn’t be kept up to date even with minor updates. Also, again, the minor updates happen automatically normally, so a developer wouldn’t be involved with them or need approval. But, we value your feedback and agree with encouraging other website owners by adhering to the same web security best practices. You’ll see that with our website renewal we’ve updated our WP version. Your website is currently running WordPress 4.7.2, while the latest version is 4.7.5. Version 4.7.3 and 4.7.5 are security updates. Not only have you not resolved whatever was causing you to miss minor updates, which normally would happen automatically, but even when you update you are lagging far behind, as version 4.7.3 was released in March. Website owners choose to deploy active protection like WAFs because addressing all vulnerabilities in a website through meticulous secure coding and design is very difficult for most. Rapidly evolving unknown and modified threats, for example, cannot be anticipated and dealt with in real-time by even the most expert of developers. This somehow supposed to be an argument in favor of WAFs, but what you mentioned seems to apply more to WAFs than securing code. From our experience the companies behind WAFs and other security products, are for example, are not monitoring for the exploitation of zero-day vulnerabilities in WordPress plugins and from what we have seen in testing WordPress security plugins against vulnerabilities, without knowledge of a vulnerability a security product is unlikely to be able to protect against it. So the idea that WAFs would provide better protection (or even any protection) against new threats doesn’t seem to match what is really going on. At the same time using secure coding practices is not all that difficult, it more of an issue of getting people to use them. Selling security products that claim to provide protection they don’t isn’t going to help with a focus on making code more secure. For example if money spent on those services like our Plugin Vulnerabilities service instead, where we actual help to get vulnerabilities in WordPress plugins fixed, then everybody would be getting more secure code.